Lake Voui, atop Vanuatu's Ambae Volcano. Fans of “Survivor” might recognize the name Vanuatu. But hosting an iconic reality television show isn’t this remote South Pacific island nation’s only distinction. In May, the volcanic lake atop Vanuatu’s Ambae Volcano morphed from its normally brilliant green color to a bright, blood red. 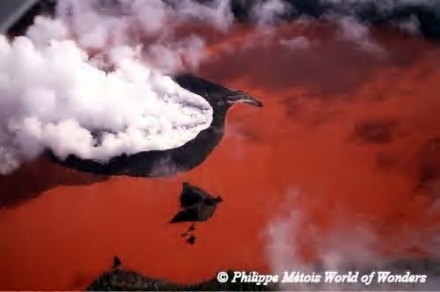 Scientists conducting an aerial survey of Ambae’s recent volcanic activity were surprised when they flew over Lake Voui and spied its striking new color. “It was a real surprise! Rapid color changes are very rarely observed on volcanic lakes,” says geologist Alain Bernard of the Université Libre de Bruxelles in Belgium. Geologists think the unusual color change occurs when the iron that seeps up from rocks beneath the volcano reacts with air at the surface. But they are eager to study exactly why this phenomenon occurs—though it’s rare, this is not the first time they’ve seen it. One of the three volcanic lakes atop the Keli Mutu Volcano on Indonesia’s Flores Island was always well known by natives for its tendency to turn red. It is named Tiwu Ata Polo, which means “enchanted lake.” The exotic lake even appeared on the country’s currency, but it was unknown to western scientists until 1989. When locals clued them in to the oddity, geologists scaled the volcano to take water samples. Based on what they found, they proposed the iron-meets-air mechanism behind the vivid color changes. “And I think the same thing is happening here,” says Johan Varekamp, a Wesleyan University geologist who studied the Keli Mutu lakes. Deep inside a volcano like Ambae, super-hot magma releases gases that dissolve in water that has seeped down from the surface. The dissolved gases acidify the water (sometimes even to a negative pH, making it more acidic than battery acid). The hot acidic waters “attack the surrounding rocks” and dissolve the minerals they contain, says Varekamp, including iron. Because the hot water is less dense than colder water above it, it works its way up to the surface, where it can form a volcanic lake. Although a volcanic lake may contain many different dissolved minerals, iron is the key to a lake’s color change. The process that turns the iron-enriched water red is similar to what causes steel to rust or blood to turn red. When the iron in steel is exposed to oxygen in the air and water, it forms iron oxides, or rust. Similarly, iron-containing hemoglobin gives blood its red color when oxygen attaches to it. Usually, the mineral-enriched water sits at the bottom of the lake and the particular form of dissolved iron gives the water a vivid green hue. The water changes to its crimson color when some force stirs up the water and brings oxygen in contact with the iron—in a way, the lake is rusting. In the case of the Keli Mutu lakes, winds from the wet season’s storms mix up the waters of the lake. The oxygen can’t get to the iron without an outside force stirring up the lake because it would have to diffuse through the water, which is a much slower process. As the winds of the wet season subside and minerals in the water settle out again, the enchanted lakes revert to their greenish tint for the duration of the dry season. Winds might also have stirred up Lake Voui’s crimson color, but according to Varekamp, Ambae’s recent volcanic activity could have produced a “violent convective motion” that mixed up the lake water and produced the iron oxides that scientists found coating the lakebed. “The exact origin of this color change is still puzzling us,” says Bernard. But once the iron oxides fall out of the water and sink to the bottom of the lake, it will probably revert to its original electric blue-green. Even if it does change back, for a while, Vanuatu had it’s own enchanted lake. Thank you for the information. I live in Naples Italy, close to Lago De Averno. The lake is usually green. Today I drove by and it is red. Is this poosibly a warning sign of Mt vesuvious? I need more Imformation even tho this is very informative. I am doing a speech on Lake Voui and would need more information. I love this site though. It’s the best I have found so far. Thank You for you help. Great common sense here. Wish Id tghouht of that.